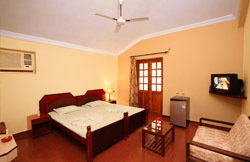 60 AC and Non-AC rooms have a single or double beds, en suite shower, fridge, ceiling fan, satellite TV. All rooms have balconies. © 2018 SaldanhaHolidays. All rights reserved.